This is a history-making discovery that could unlock decades-old questions about the origin of our own Sun and planets, giving insight into how these celestial bodies were born. Reference: "The JCMT Transient Survey: An Extraordinary Submillimetre Flare in the T Tauri Binary System JW 566," Steve Mairs et al., 2019 Jan. 23, Astrophysical Journal [https://iopscience.iop.org/article/10.3847/1538-4357/aaf3b1, preprint: https://arxiv.org/abs/1812.00016]. The Maunakea Observatories are a collaboration of independent institutions with telescopes located on Maunakea on the island of Hawaii. 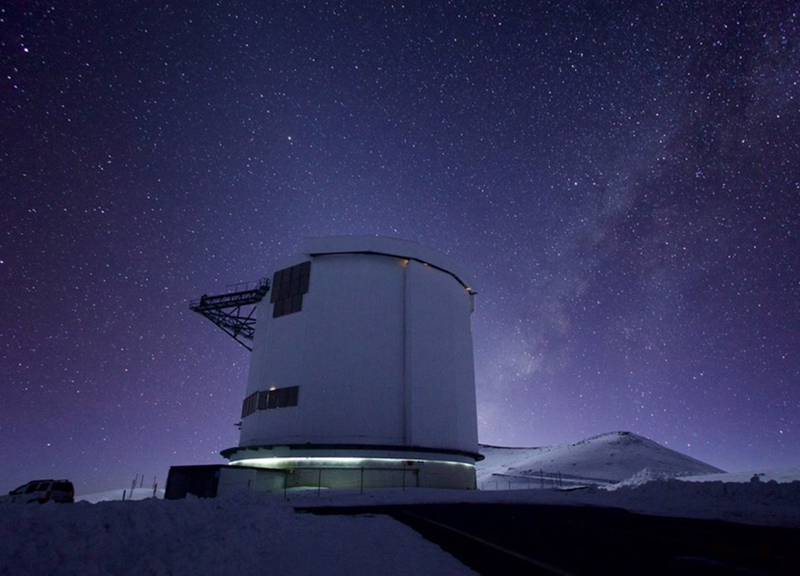 Together, the Observatories make Maunakea the most scientifically productive site for astronomy worldwide. The Maunakea Observatories include Caltech Submillimeter Observatory, Canada-France-Hawaii Telescope, Gemini International Observatory, James Clerk Maxwell Telescope (EAO), NASA Infrared Telescope Facility, Subaru Telescope, Submillimeter Array, United Kingdom Infrared Telescope, University of Hawaii Hilo Educational Telescope, University of Hawaii 2.2 Meter Telescope, Very Long Baseline Array and W. M. Keck Observatory (Keck I and Keck II). Owned by the East Asian Observatory, the James Clerk Maxwell Telescope (JCMT) is the largest astronomical telescope in the world designed specifically to operate in the submillimeter wavelength region of the spectrum. The JCMT has a diameter of 15 meters and is used to study our solar system, interstellar and circumstellar dust and gas, and distant galaxies. It is situated near the summit of Maunakea, Hawaii, at an altitude of 4092 meters. The JCMT Transient Survey team is an international collaboration of 80 astronomers led by Dr. Gregory Herczeg of Peking University (Kavli Institute for Astronomy and Astrophysics) and Dr. Doug Johnstone (National Research Council of Canada). The team has been monitoring 8 star forming regions in the Milky Way monthly since December 2015. Their survey will continue through January 2020.